“Discussion of digital television has focused on switch-over dates, set-top boxes, and the technical and economic implications of switch-over. This paper, by contrast, focuses on public interest obligations and citizenship values such as freedom, access, universality, political pluralism and content diversity. Petros Iosifi distinguishes broadly between public interest priorities as understood in Western Europe, and in Central and Eastern Europe. 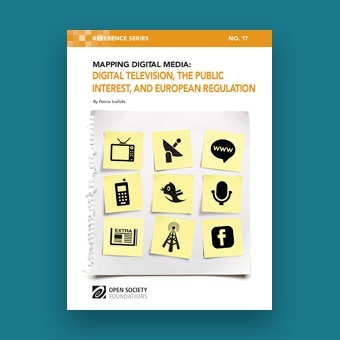 After assessing some obvious benefits of digital TV (extra channels, converged communications, enhanced interactivity and mobility), he argues that the public interest outcomes from the introduction of new technologies like the internet and digital TV will depend on how people use them, for new technology is only a vehicle by means of which public interest goals can be achieved.He then considers digital TV penetration data from across Europe, as well as the status of national digital switch-over plans, stressing that northern Europe is much more advanced in this regard than Southern and Eastern Central Europe.